As the music scene in Charlotte, NC continues to grow, emerging groups like Carolinas' BFAM are continuously contributing to the local music. Their sophomore album (From The Cradle 2 The Stage) is definitely a reason to support independent artists. 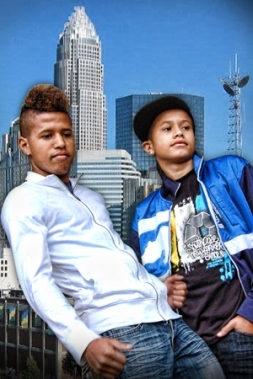 May 24, 2012 - PRLog -- If you are just hearing about Carolinas' BFAM, they are a teenage hip-hop group in Charlotte,NC. A year and a few months ago, they were celebrating their debut album, A FAMILY REUNION. Now they are ecstatic about their sophomore album, FROM THE CRADLE 2 THE STAGE. This album is what you would consider a universal album with instrumentals crafted by their producer, MEZONIC of M.R.P.E, LLC. It literally has an international feel. In a music world where major record labels restrict their artists from trying new things & sounds, their producer, Mezonic in fact welcomes creativity. The album is definitely a classic for teenagers, elementary, & middle school kids. Nowadays, there are not many young kids creating professional music on this level. The album consists of 11 songs with titles like BRAT SWAG, HALLOWEEN, DREAM GIRL plus more. Carolinas' BFAM thinks the world should hear DREAM GIRL & BRAT SWAG first. If you've already checked out their first album, you will probably end up purchasing the CD before it hits CDBABY.COM & iTunes.com. This CD will be a great gift for all music lovers of all ages and the tunes should keep them occupied for years to come. Look out for music videos, show videos, and connect with Carolinas' BFAM on http://www.mrpellc.com/carolinas_bfam, FACEBOOK, & Twitter. The group is available for interviews and show performances like birthday parties, radio performances, concerts, plus more. Feel free to contact their manager through info@mrpellc.com. Ronnell Bryant Jr and Xavier Bryant are the founding members of the group. This dynamic duo is known as RJ and Ziggy to all of their friends and family. The group will continue to support other up and coming artists such as the featured artists heard on the group’s first album “A Family Reunion”. RJ was born on May 1st 1995 in Charlotte North Carolina. He enjoys music of all types and athletic activities. He enjoys running and workouts, as his six pack will attest to. RJ has played organized basketball for teams and won the city championship with a steal and assist to his younger brother for a buzzer beater. RJ is the primary songwriter for the group and is a major contributor to the group’s success. He has his driver’s permit and cannot wait until his 16th birthday to drive solo…..
Ziggy was born on May 13th of 1997 in Charlotte North Carolina. He enjoys music, basketball, video games and watching good movies. He has played on multiple AAU teams as the shooting guard because of his deadliness from 3 point range. Ziggy is always the life of the party and brings his best when on stage. Ziggy is never camera shy “if you click it, he’s wit it”. His friends range from every demographic and every walk of life. According to Zig, “If he’s not the best then at least he’s the one you’ll like”. Tiimyr Roberts was born September 13, 1997 in Charlotte,NC. He has been a brother from another mother for 5 years now and was welcomed as the group’s first featured artist in August of 2010. Aside from rapping, Tiimyr spends his time playing video games, dancing and listening to music.